Farnese Palace (Palazzo Farnese) was built for Alessandro Farnese, the future Pope Paul III who purchased the village of Caprarola in 1504. A few years later the project of building a pentagon shaped fortress was given to Antonio da Sangallo the Younger. 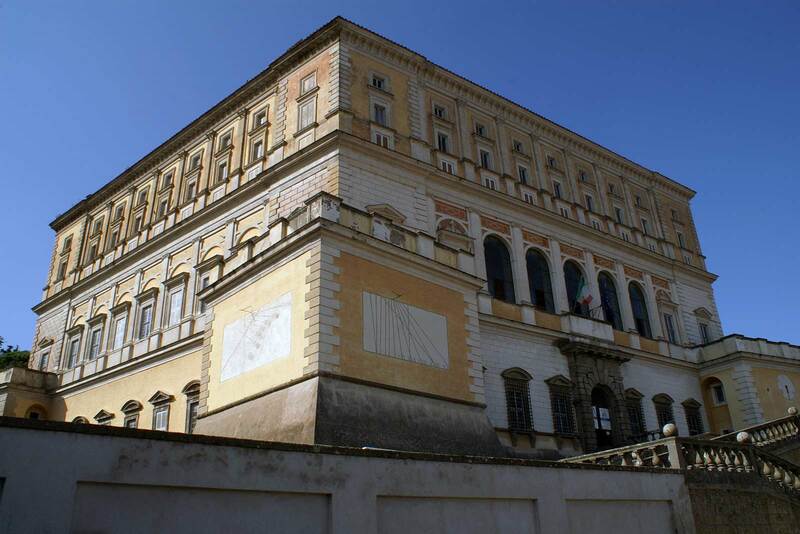 The actual palace was built thanks to the pope’s nephew, also named Alessandro Farnese, who commissioned the architectural works to Vignola and called the greatest artists of the day to fresco and decorate the palace. All these artists followed a general project by Annibale Caro, one of the numerous learned men in Cardinal Alessandro’s entourage. The fortress became a palace while maintaining its original pentagon shape which shows its military origins. The palace was built on numerous levels, from the underground level to the first floor where the gentlemen were housed to the servants’ quarters under the roof. One arrives to the most important level, the piano nobile, using the magnificent staircase known as the Scala Regia. This floor is divided into the winter apartment and the summer apartment and has a total of 15 rooms including a chapel. The frescoes of the different rooms and the Scala Regia were done mainly by Federico and Taddeo Zuccari, Antonio Tempesta and Bertoja. Other painters who decorated the palace include Giovanni De Vecchi, Raffaellino da Reggio who painted the room of the maps (Mappamondo) and by the specialist Giovanni Antonio Vanosino. The palace is completed by the beautiful garden designed by Vignola and includes the Lower (Secret) Gardens and the upper gardens with the Hunting Lodge and the Pleasure villa. Palazzo Farnese was a private residence until recently and was used for official state events. Among those who have resided here are past president of the Italian Republic, Luigi Einaudi and the Prince of Wales, Charles of England.